Take a bowl, add wheat flour, salt, oil and mix it well. Add water and knead dough. Keep it aside. Take a bowl. Add crumbled tofu, green chillies, ginger-garlic paste, salt, lemon juice and mix it well. Make small balls from dough. Roll the roti from the dough. Make two such rotis. 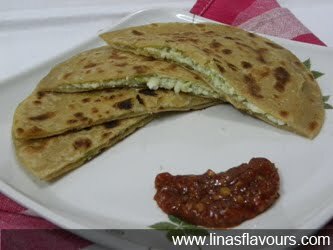 Spread the stuffing on one roti and cover it with other. Roll it again into big roti with light hands. Serve it immediately with curd or chutney.